I have now seen the aforementioned letters and though both appear to have been written by Charles they do confirm that the engagement was a more serious and public matter than indicated in his autobiography. His mother Amy was deeply upset about the whole affair and Robert was, to say the least, less than sympathetic.In Charles’ defence he does appear to have attempted to end the engagement with care and consideration, which unfortunately did not impress Elvira (or anyone else). The relationship obviously caused great anguish to both the Graves and Mullens families and caused a lasting rift between Robert and Charles. The letters are largely concerned with justifying his actions to Lord and Lady Mullens and reveal little about Elvira. However, R.P. Graves’ biography of his uncle Robert is a little more forthcoming. So, in 1924, Elvira already had a reputation as being “highly neurotic” and was prone to erratic (well. downright eccentric) behaviour. For Elvira, love would always come in “devastating” ways. I’m still a little uneasy with Charles’ account of the events of that night but it seems to be generally accepted so I’ll let it pass. I was surprised at Robert’s reaction, I always thought he was more Bohemian than that. He himself was a bit “caddish” as far as Charles’ letters were concerned. On one of them , the real names are crossed out and fictional ones inserted. Robert was evidently going to use them in a short story or novel. Whether Charles ever saw Elvira again is not known. As a journalist, theatre reviewer, sports correspondent and archetypal “man about town”, he definitely moved in similar circles. He was present at the infamous Bath and Bottle party (hosts – Brian Howard, Elizabeth Ponsonby, Eddie Gathorne-Hardy and Babe Plunket Greene) which is, for many, the very apex of the Bright Young People phenomenon. Like Elvira, he was a member of Ciro’s and The Cafe De Paris and was a keen first-nighter and diner-out, so my guess is that their paths must have crossed at some point. Elvira would have been 19 when engaged to Charles, who was 25. If engagements were the serious matter in the way that Robert patently thought them to be (I must confess, my knowledge of 1920s engagements is largely conditioned by P.G.Wodehouse’s Bertie Wooster) then the effect of this rejection was likely to be great upon any ordinary young woman. On someone as highly-strung as Elvira, who knows what the lasting damage might have been? Among the items that the police catalogued in Elvira’s bathroom (see https://elvirabarney.wordpress.com/2011/11/04/elviras-reading-matter/ ) was a business card from J.Smith and Co Motor Agents. 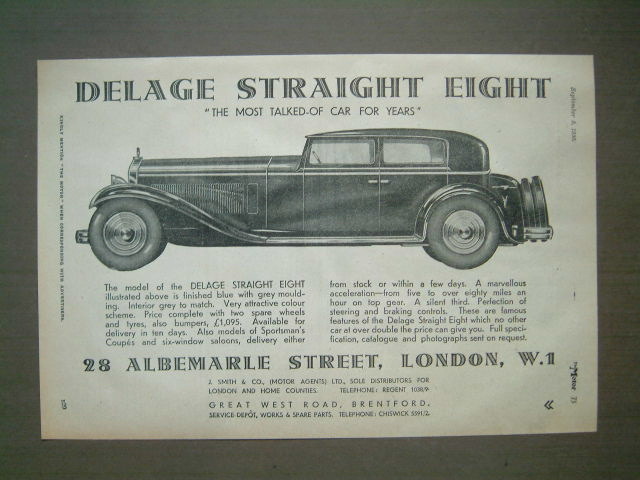 They operated from 28 Albemarle Street, Mayfair, and held the concession for the importation of the French luxury cars, Delage. Given Elvira’s love of her model and her regular scrapes and crashes, she was undoubtedly a very valued customer. 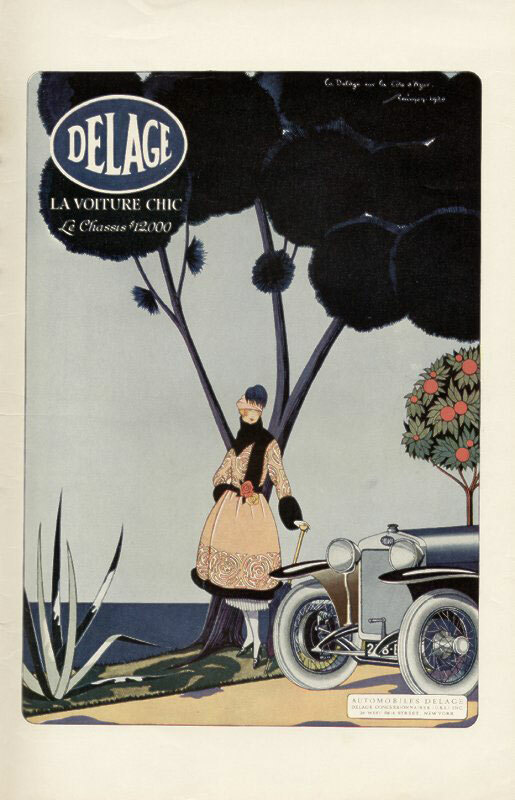 J. Smith and Co. capitalised on this and, being situated where they were, were ideally placed to market the vehicles to Mayfair and Knightsbridge’s wealthy inhabitants. I don’t suppose their turnover was enormous but then it would not need to have been. Exclusivity was part of the charm. 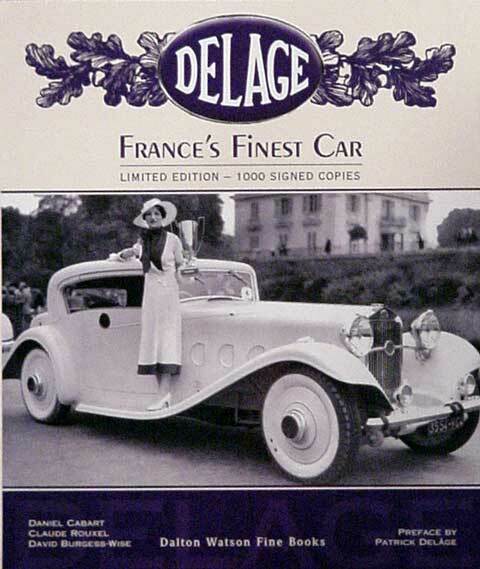 I can’t be absolutely positive of this, but Delage cars do seem to have had a particular appeal for female drivers. 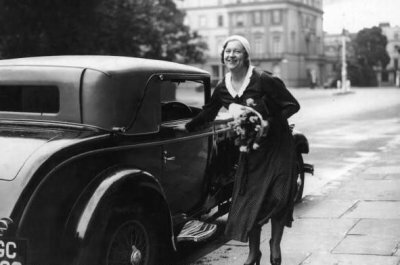 Many of the photographs from the 1930s show the car next to a pretty young woman but, unlike the more familiar “cheesecake” models of the 1950s and 1960s, many of these women look as if they might actually own the car. The combination of privilege, social freedom and sexual independence discernible in these images is not , I think, accidental. In England, some of these associations might be down to a woman whose exploits Elvira (a keen sports fan) would have certainly followed. 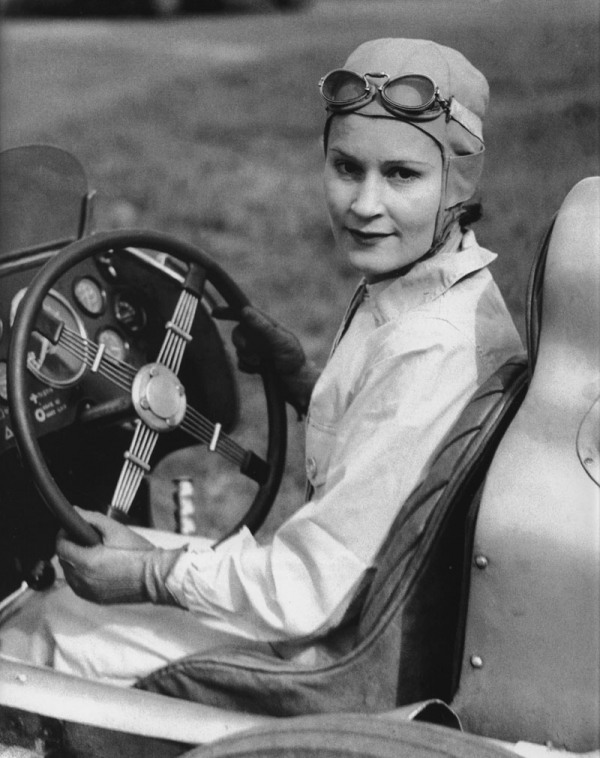 About the time Elvira purchased her Delage, the Queen of Brooklands was the diminutive Kay Petre, then the best known female racing-driver in the country. 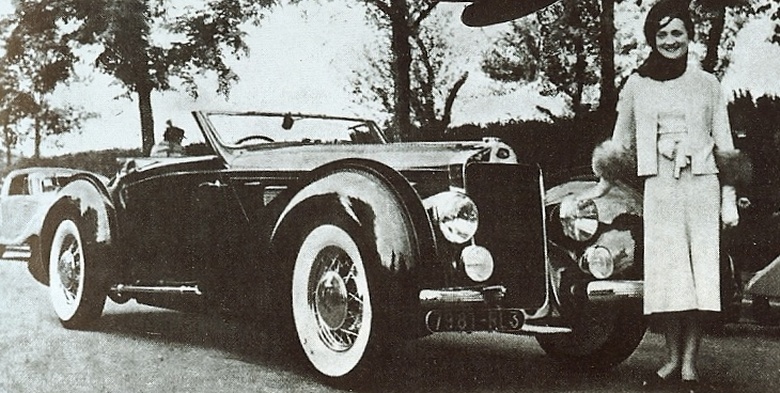 In the early thirties, the much-photographed Petre drove a Delage. Here are some more examples. The emphasis is on glamour and modernity in equal measure. 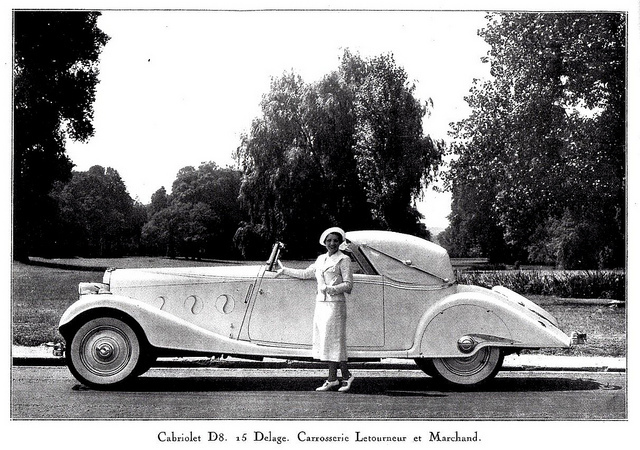 The wealthy young woman in a sports car is a key iconic image of the inter-war years and Delage, who essentially fitted racing-car quality engines into luxury bodies, enthusiastically fed, and fed upon, that image. 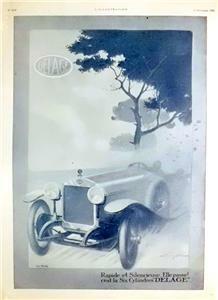 I ought to mention that one aspect of Delage’s English advertising campaign was that the car was both fast and safe. In Elvira’s case, this obviously fell on deaf ears. Albemarle Street has other connections with Elvira, some actual and some coincidental. 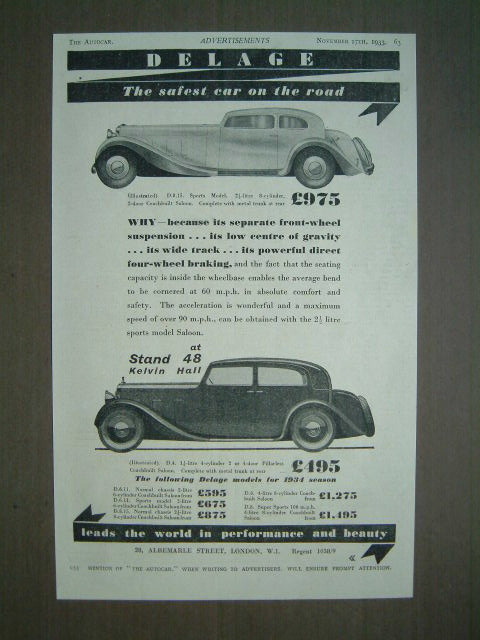 Staying with the motor trade for a moment, Sir Malcolm Campbell had a car sales venture there in the early 1920s, during which time one of his financial backers was Joe Carstairs. 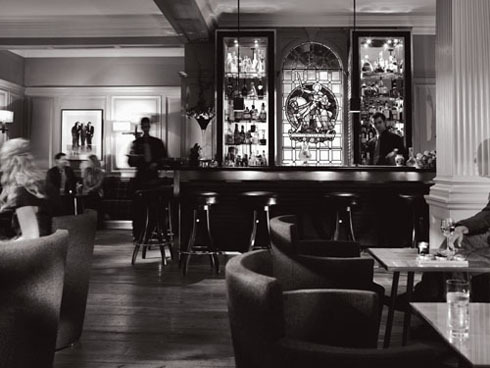 The nightclub “Uncle’s” was situated in Albemarle Street. Known as “Nunky’s” to the Bright Young People, who had an annoying fondness for infantilising the language, it was a favourite watering-hole of Charles Graves and he would have doubtless taken Elvira there during their ill-fated engagement. An earlier sexual scandal, one which still resonated among Elvira’s friends, had started at the Albemarle club (No.13). This was where the Marquis of Quensberry left his calling card for Oscar Wilde (“the posing somdomite”), thus provoking the libel action which was to destroy Wilde’s career. Other literary connections could be found at Murray’s (No.50), publishers of Lord Byron and later John Betjeman. Brown’s Hotel is also on the street (No.33). 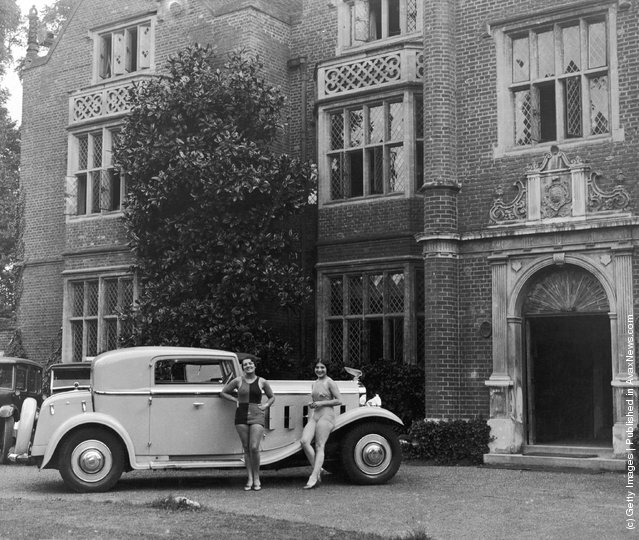 The remarkably unchanged Brown’s was the real-life inspiration for Agatha Christie’s At Bertram’s Hotel in which the murderer is a young woman named Elvira. All very psychogeographical, I feel. 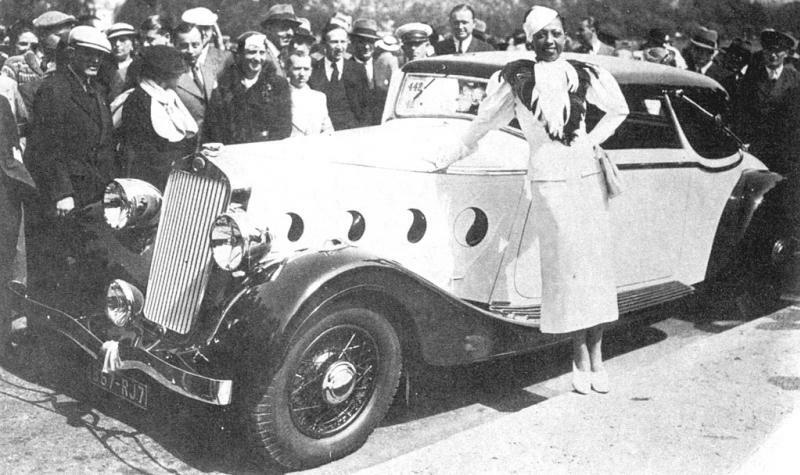 UPDATE I’ve just come across these pictures of Josephine Baker. Baker was an artist much loved by the Bright Young People. Elvira saw her shows in Paris. 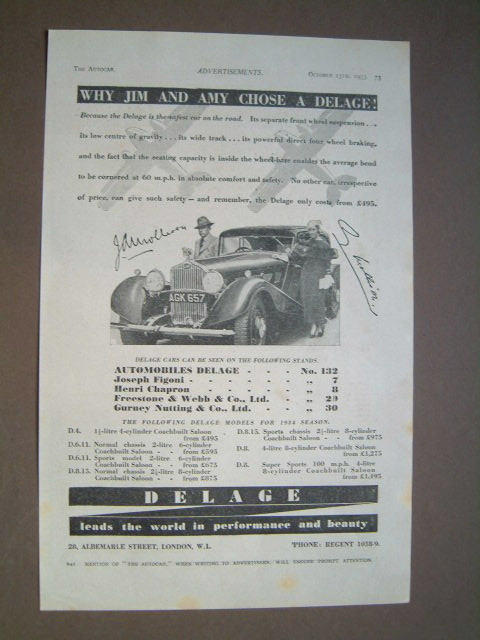 The cars are, of course, Delages. The incident between Elvira and Charles Graves (see https://elvirabarney.wordpress.com/2011/10/13/charles-graves/ ) actually happened earlier than I thought. In the Robert Graves collection at St.John’s College,Oxford, there are two draft letters (with annotations by the poet) to Sir John Mullens concerning the end of Charles’ engagement to Elvira. One is from Charles Graves (dated 26th September 1924) and the other from their mother, Amy Graves, dated the 27th September. Although I have yet to see the letters, a number of points arise from this information alone. 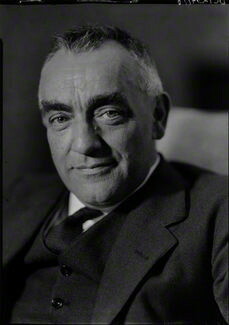 Firstly, the engagement, ” unofficial” and the result of a “brief flirtation” according to Charles Graves in his autobiography, was obviously a more serious and public affair than he suggested, with both families heavily involved in clearing up the mess.Were they covering up a potential scandal or was there more to it than that? Why are the letters with Robert when he was not particularly close to his brother ? Secondly, it confirms that Elvira’s emotional state and her fears of rejection were always a matter of concern to those around her and not everything can be blamed on the worthless Mr.Barney, or on her later predilection for drink and drugs. Finally, it suggests that Elvira was training for the stage for a rather longer period than usually implied. This would partly explain the number of actors and actresses in her circle of friends and acquaintances. Hopefully, the letters might clear up the question of the gun and whether Charles or Viva King’s account of the episode is closer to the truth. 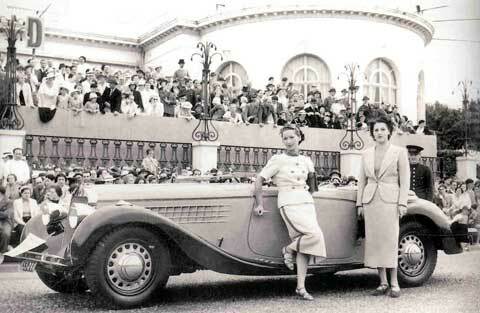 As the daughter of very wealthy parents, Elvira Mullens had no need to worry about a career. She would have done “the season” . attended the usual round of balls and socially sanctioned sporting events – Henley, Eton v. Harrow at Lords and so forth. At the end of this, a suitably moneyed and,possibly, titled suitor would emerge.For some reason, this did not happen. Perhaps Elvira was already rebellious and disaffected; we know her home life was less than happy. Perhaps her personality told against her; could it be that her legendary rudeness and quick temper were already apparent? Anyway, around 1925, having watched her younger sister marry a Russian prince, Elvira decided that she would try her luck as an actress. Before the War being an actress had been seen as a possible route towards a title, as to some extent it remained throughout the twentieth century. 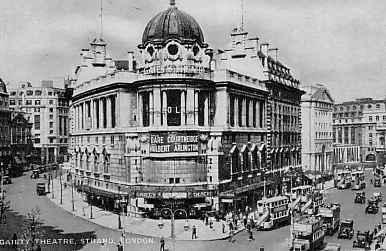 In the 1920s however, the stage, increasingly respectable thanks to the growing number of theatrical knights, saw a growing number of the daughters of the well-heeled and ennobled treading the boards. 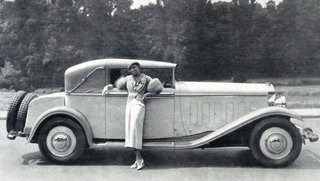 An added glamour was provided by the likes of Lady Diana Cooper, pre-war member of The Coterie and considered England’s leading beauty,who from 1919 pursued a successful career on stage and in silent pictures. Many of Elvira’s social circle , including some attendees at the cocktail party, belonged to this new generation.Their immediate idol and inspiration was Tallulah Bankhead, whose sensational arrival on the London stage earned her not only adoring male fans but a legion of fanatical young female followers. 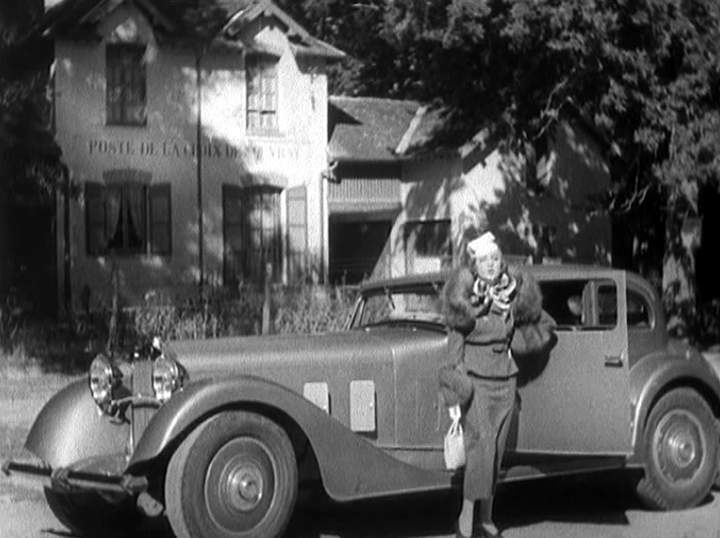 Given that Elvira kept Tallulah’s picture by her bedside while awaiting trial, one can be sure that she was one of Tallulah’s would-be “groupies”. Tallulah was a key part of the Bright Young scene, knew “The Blue Lantern” and may well have attended parties at Belgrave Square. Preparatory to her new career, Elvira studied at Lady Constance Benson’s Acting School. Most commentators on the trial see something intrinsically comical about this, but it was a well-regarded establishment run by a leading Shakesperian actress (and wife of Frank Benson). The school’s most famous ex-pupil was, the then only recently graduated, John Gielgud. It was toward the end of her time there that she met Charles Graves (see https://elvirabarney.wordpress.com/tag/charles-graves/ ) – a moment which, in hindsight, marks the beginning of her notoriety. Elvira,as with most other aspects of her life, was not to make a success out of acting. 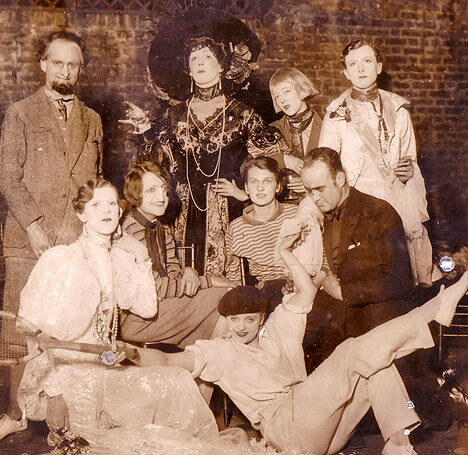 The beginning was prestigious enough – a small part, probably in the chorus, in Rudolf Friml’s “The Blue Kitten” which opened in late 1925 at the Gaiety theatre and ran for 140 performances. The beginning, however, was also the ending as there is no evidence of any further public appearances for the would be starlet who, using her middle and her mother’s maiden name, called herself “Dolores Ashley”. 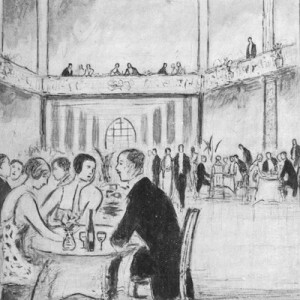 She did get to know a number of actors and actresses and Irene MacBrayne, who was at the cocktail party, knew her from that period.Like most socialites of the era she was a diligent “First Night” devotee. The police found many programmes for shows in her bathroom at 21 William Mews.Certainly there remained something decidedly “theatrical” about Elvira’s public persona. It is perhaps not too impudent to wonder whether her perfectly rehearsed performance at the trial owed something to Lady Benson’s tutelage. 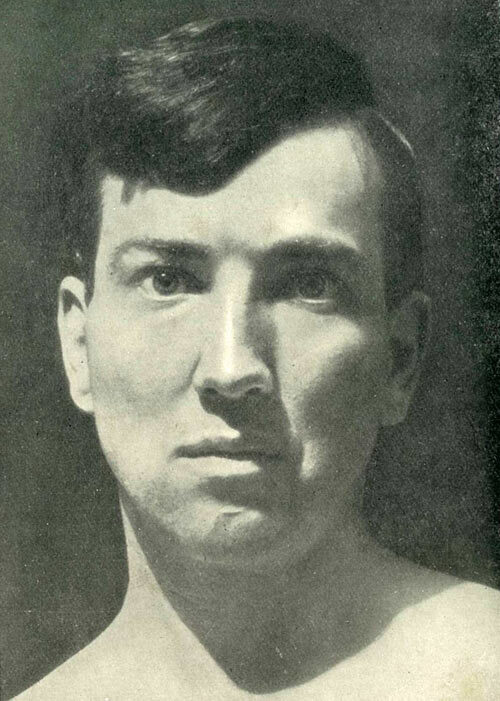 Viva King’s revealing comments about Elvira (see https://elvirabarney.wordpress.com/2011/10/12/viva-king/ ) are given weight by Charles Graves, in his 1951 autobiography, “The Bad Old Days”. Charles Graves (1899-1971) was the younger brother of the poet Robert Graves and a journalist and prolific author (146 books!). He was also, in the 1920s, one of that army of gossip writers who did so much to publicise The Bright Young People. Unlike King , his re-telling of the circumstances of his brief affair with Elvira seeks to show her suicidal rather than homicidal nature and hence support the Not Guilty verdict in the shooting of Scott Stephen. I am not entirely convinced that the facts, as he expounds them, warrant such an inference. All very intriguing – if not entirely convincing. No shot fired – as opposed to Viva King’s version and a rather excessive use of gentlemanly mea culpa. What is very significant is that these events took place in 1925 or 1926 – well before Elvira’s disastrous marriage, which was always cited as the start of her descent into emotional chaos.